The U.S. government’s NPARC Alliance has released CFD solver Wind-US v3 for production use. Improvements relative to earlier releases include improved unstructured accuracy and robustness and consistency of physical models across both the structured and unstructured solvers. Version 3 also includes upgrades to the structured solver and various other chemistry and general improvements. Five years in the making, Intelligent Light’s FieldView 13 CFD postprocessing software offers significant improvements over previous versions. Interactive speed-ups of up to 20x are made possible by multi-core and GPU computing. Working with large datasets (for example, a transient simulation where each time step consists of 2 billion points) is made easier through the use of FieldView’s extract databases. Flow Science received the Intel Cluster Ready Voyager Award for their work on developing HPC cluster-ready versions of their FLOW-3D CFD software. The award was presented at the SC11 conference. NVIDIA’s new Maximus desktop computer includes a CPU, a Quadro GPU, and a Tesla GPU and the ability to dynamically balance these resources among your applications including CFD. Entry price point for a Maximus workstation is expected to be around $8,000. Autodesk’s wind tunnel simulation tool for Alias called Project Falcon is now available for standalone use with the addition of STL geometry import. According to Autodesk, this opens the door to “conceptual wind tunnel modeling to everyone.” Be sure to check out the validation file PDF. Symscape’s Caedium CFD software was highly visible at SC11, both in a demo station and in a presentation by Microsoft’s director of development for technical computing. Starting with a Google SketchUp model, Caedium was used to compute the flow around a sailing yacht. Symscape‘s November newsletter is out. CFD and wind tunnel testing of the Camaro ZL1 contributed to its aerodynamic characteristics. Chevrolet plans to introduce this model in 2012. CFD is used for refurbishing refrigeration cases in the UK. 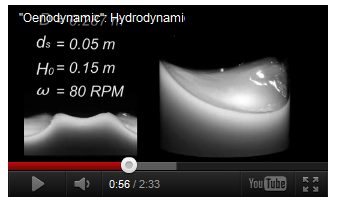 Ventilation of the SHARK’s Speed-R motorcycle helmet was verified using CFD. 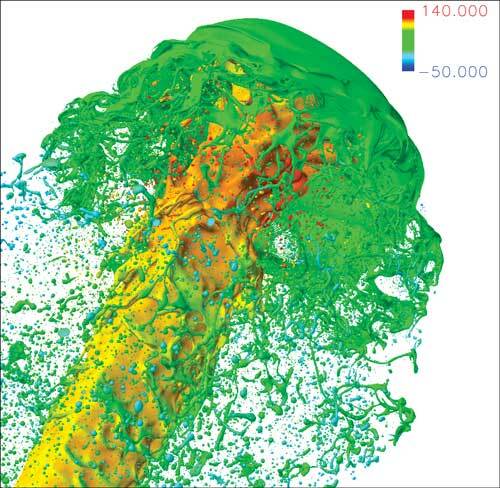 FloEFD brings fluid/thermal simulation to NX. CFD saves $300,000 and reduces time to market by 6 months on a high-tech boiler. CFD shows that fabric HVAC ducts are 22-27% more energy efficient than metal ducts. Don Computing is hosting the International Computational Modeling Validation Conference in Syndey, Australia on 14-15 Jan 2012. CFD in Medicine and Biology will be held on 25-30 March 2012 at the Crowne Plaza Dead Sea in Israel. Final reports from the International Towing Tank Conference are now available online including the report of the CFD specialist committee. Altair is hosting a CFD Lunch and Learn Session for their AcuSolve technology at their headquarters in Troy, Michigan on 7 Dec.
On the other hand, why is it that people rarely spill wine despite all the oenological swirling? Researchers have determined the factors at play in swirling wine are the depth of the wine relative to the diameter of the glass, the diameter of the glass relative to the diameter of the swirling motion, and the centrifugal and gravitational forces on the fluid. Maybe all these wine drinkers are spilling their coffee the morning after. This entry was posted in Applications, Events, News and tagged AcuSolve, Altair, Autodesk, Caedium, FIeldView, FloEFD, Intelligent Light, Mentor Graphics, NVIDIA, Project Falcon, Symscape. Bookmark the permalink. When I read the paper on fabric HVAC ducts vs. metal ones, I did not think it was a fair comparison. The paper compared metal ducts with diffusers to fabric ducts with strategically placed holes. The paper did not compare metal ducts with strategically placed holes to fabric ones with strategically placed holes. So what’s the point of the paper? One just needs to look at figure 2 of the paper and use common sense to establish a good guess of what the outcome will be. I don’t think CFD was required. Or have computers taken away our ability to think? Personally, I think it would have been more interesting to show metal vs. fabric, both with holes. It seems like an obvious comparison to make. So why did the authors not show that? Martin: I can only guess that the difference in the ducts (diffuser vs. holes) was due to analyzing an existing system as installed versus the improvement to be gained by replacing it with a new system as designed. Obviously, an apples-to-apples comparison could have been done for both metal and fabric cuts with holes. In other words, perhaps the blog post title was a little over-reaching in saying fabric is better than metal rather than the PDF of the paper itself which is about two and only two very specific installations. Whether computers have withered our ability to think is the topic for another blog post!